with Polak Mandell's Gallery, Jersey, where purchased by the present owner in May 1984. Helen Bradley was born in Oldham, Lancashire in 1900. She attended the local Art School for only two terms in 1914 but did not start painting seriously until 1960. Her pictures reflect the reminiscences of her childhood and feature a cast of characters around whom she weaves the story of a particular event. 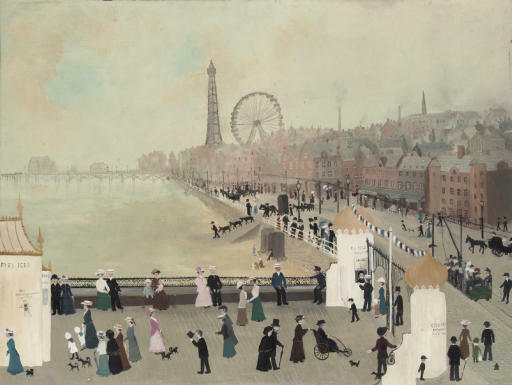 In the present work, one of the largest compositions by the artist, the famous landscape of Blackpool provides a backdrop for all her usual characters including Miss Carter (who work pink), Mr Taylor (the bank manager) and the dogs Gyp and Barney. Rather than sign her paintings, Bradley often used a fly, as seen in the present work.